Buyer Beware: What are you supporting when you purchase Fair Trade Tea sourced from PLANTATIONS? | Small Farmers. Big Change. Buyer Beware: What are you supporting when you purchase Fair Trade Tea sourced from PLANTATIONS? Sadly, this is no longer true across all products that carry one of the many fair trade labels appearing in the market. Especially in the case of those products, that are sourced from large plantations, such as bananas and tea, it is less clear what (if any) positive impact comes from the fair trade certification. In the case of tea, especially from India, several studies have come out recently which suggest that not only are working and living conditions on some of these plantations deplorable, but that they are actually worse than conditions on neighboring non-certified plantations. In fact, it has been argued that by allowing these brands to market their tea as fair trade, and misleading consumers into thinking they are supporting positive social change, the certifiers are creating a greater disservice to tea plantation workers. We ask companies marketing plantation-sourced tea to REFRAIN from using the fair trade label and we ask the certifiers to STOP certifiying plantation tea from India as fair trade. We ask consumers to learn more about the conditions on plantations, fair trade or otherwise, and the practices of the companies that source from them. 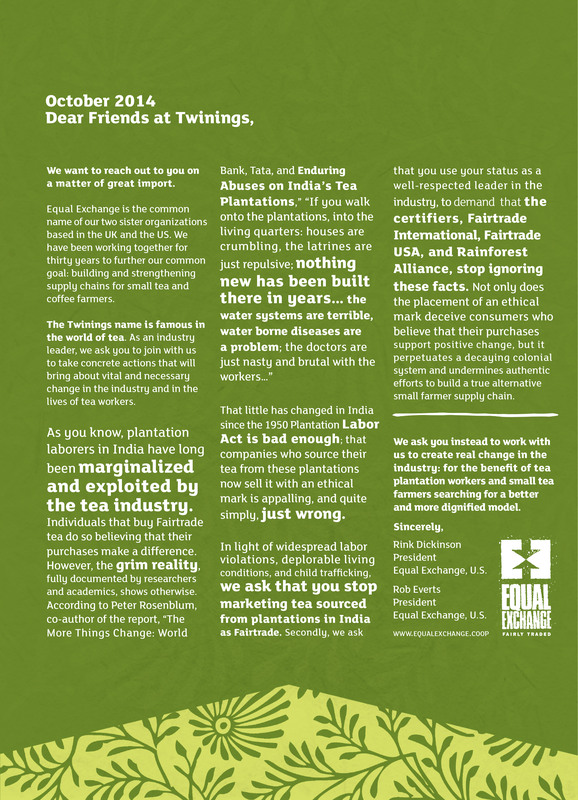 Below is a paid ad that Equal Exchange has published in several newspapers last week asking Twinings Tea Company to do the right thing. Thank you for educating me on the tea industry. The ad is GREAT and I hope Twinings and others (especially the certifiers who clearly lack integrity) will take action. Thanks for publicizing this big problem.